Walgreens released a new coupon good for tomorrow only. Get 15% off all eligible items (really anything in the store except liquor, stamps and prescriptions…). 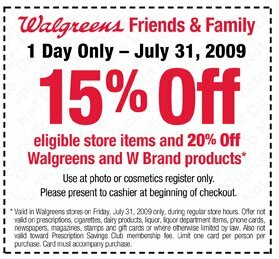 This coupon is great, it does not have the “must be used after all coupons” that other Walgreens coupons have. So you can make a tiny purchase if you like and save another 15% off. Get Back: $3 RR, makes it Free!